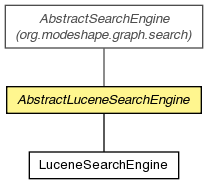 An abstract SearchEngine implementation that is set up to use the Lucene library. This provides an abstract Processor base class that has some commonly-needed methods, simplifying the implementation. However, this class does not presume any number or layout of the Lucene indexes, and requires a subclass to do that. Abstract SearchEngineProcessor implementation for the AbstractLuceneSearchEngine. Create a SearchEngine instance that uses Lucene.